I know . . . this sounds remarkably like the headlines we were seeing two years ago. In the winter of 2009, we saw a number of decomposed chicken carcasses wash up on the beaches of Hong Kong, presumably carried to the sea via the Pearl River, which flows out of Guangdong Province, China. Chinese authorities denied knowledge of any bird flu outbreaks in Guangdong Province and eventually the number of dead birds showing up on shore declined. Now, for the second time in just over a month (see H5N1 Infected Chicken Carcass On Hong Kong Beach), we’ve reports of badly decomposed chickens washed up on the beaches on the west end of of Lantau Island in Hong Kong. First some excerpts from the Press Release from Hong Kong, then a few comments. While it is possible that these birds came from a local source, their discovery on the western end of Lantau island – at the outflow of the Pearl River – is highly suggestive of a mainland China point of origin. Hong Kong lies at the mouth of the Pearl River Delta. The Pearl River, as you can see from the map above, is fed by many tributaries flowing out of Guangdong Province, China. 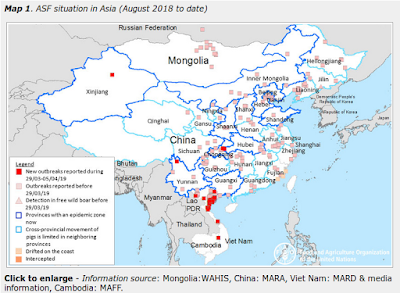 Despite some direct (and a good deal of circumstantial) evidence indicating that China continues to see bird flu in wild birds and poultry, official recognition of H5N1 outbreaks is a rarity. In addition to China’s limited surveillance and reporting capabilities, there are decided `disincentives’ for farmers and local authorities to come forth with bird flu notifications. For a farmer, reporting dead chickens invites a major culling operation, a prolonged shutdown of operations, and inconvenient questions over biosecurity lapses. And for local bureaucrats, sending `bad news’ up the chain of command can invite unwelcome scrutiny from officials in Beijing, an action that only rarely turns out to a good career move. So reports of animal or human disease outbreaks, environmental pollution, adulterated food products, and other adverse events are apt to be handled `locally’. At least, until they grow to the point that they can no longer be managed. While we’ve no proof as to the origin of these infected carcasses, we’ll be keeping a close watch on Guangdong Province over the coming days to see if any news of a bird flu outbreak leaks out.